To know Bogotá along with its past is very easy, because her past is always present, available to everyone who can truly appreciate it. In its nineteenth-century houses of colonial eaves and balconies is where the neighborhood of La Candelaria hides its ghosts; ghosts that once inhabited hidden courtyards and hallways. Rain bathed cobblestones, like petrified loaves of bread, reflect the clopping feet of man and beast. A family of umbrellas held by long departed souls; their bobbing ceased by the artist’s hand. Re the first photo: When I was a kid there were two newspapers – El Tiempo and La Republica. 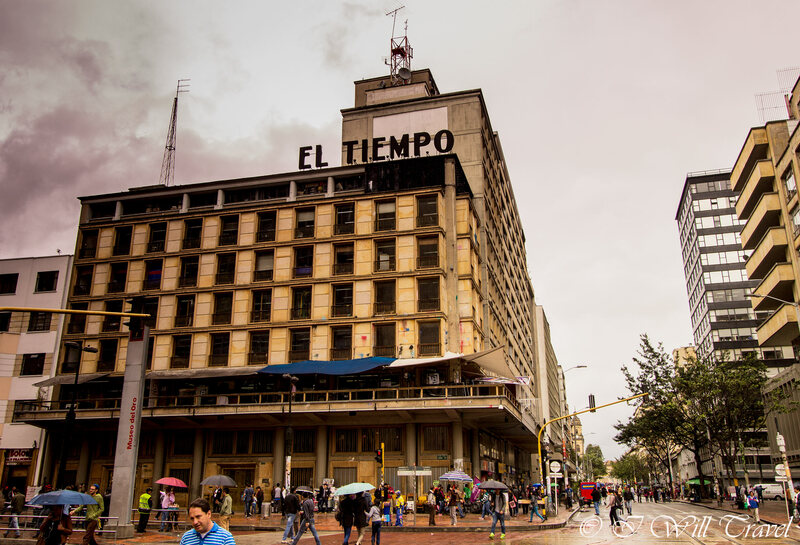 There were two boys on opposite street corners, papers under their arms, shouting – almost singing out – “El Tiempo” and the echo…”La Republica.” I can still hear them. 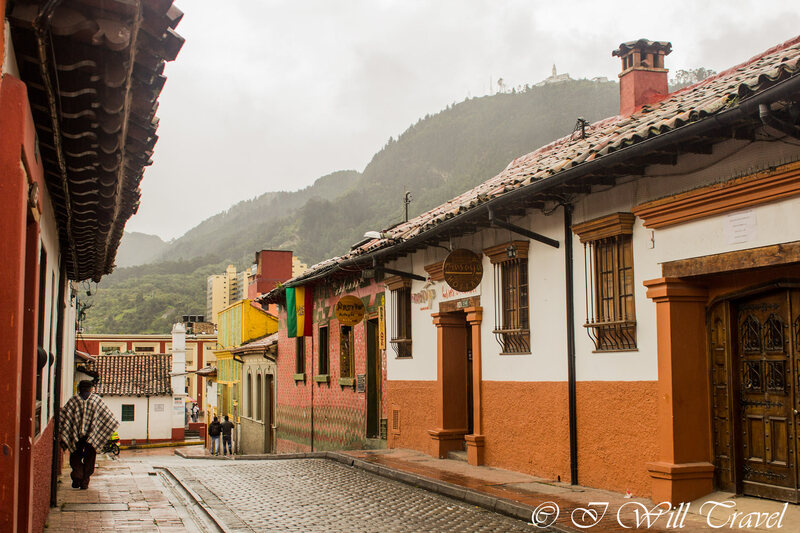 I love the photo of the man in a ruana walking down a colonial street with Monserrate in the background. A nice memory, frozen in time. You don’t see the ruanas much anymore, but everyone used to wear one – including me. Cinda, those must’ve been transforming times for Bogotá. I would love to be able to take a trip back in time to experience that. Talking about ruanas, you still see a lot of people wearing them in Tunja, where it can get really cold. On one of my trips I purchased one and brought it back to Toronto. It’s one of my all-time favourite souvenirs. Do you have one? 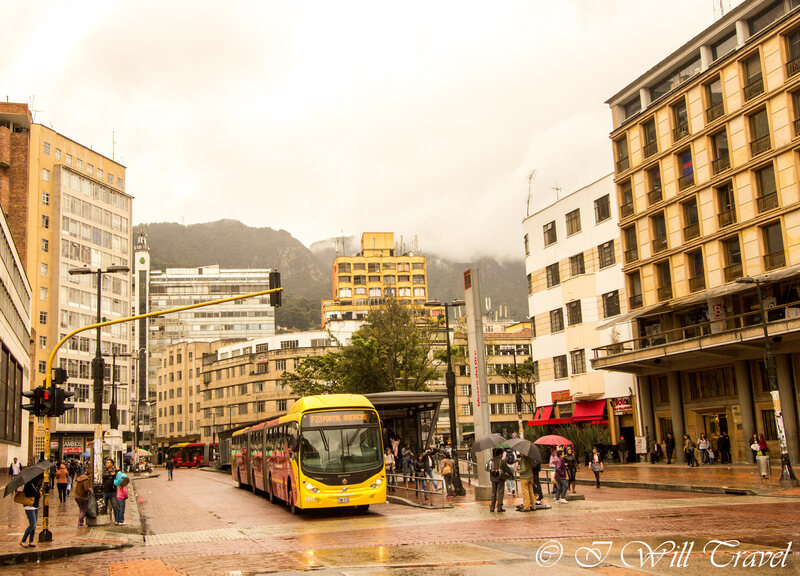 I love the beautifully mysterious and moody words and photos to capture Bogota on a rainy day. Liked it so much, I’m going back to read and look again. Cathy, you’re too kind. I love how are beautiful world can talk to us through so many different channels. The moody skies of the photos really fit in well with the words – I tend to only like taking photos when it’s sunny but the weather can really add to the atmosphere. Thanks Lucy. It was pathetic fallacy at its best… overcast skies, storms, really do something to me. These photos are lovely! I really like the one with the Volkswagen bug. Thank you Francesca! That’s one of my favourites too. That Volkswagen is very photogenic. 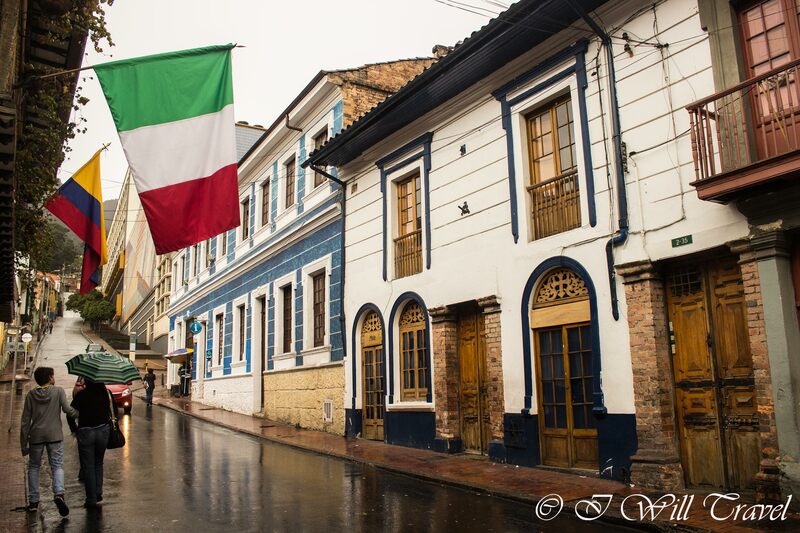 Ahh, that last photo… It reminds me of a street in Quito. I’ve only had a layover in Bogota and, as you know, Colombia is next on my South American bucket list. Can’t wait to go & see beyond the airport. I know, I was reading your post where you mentioned you would have loved to go past the airport. It’s one of those cities that certainly draws you in, right away. Tons to see and do as well. 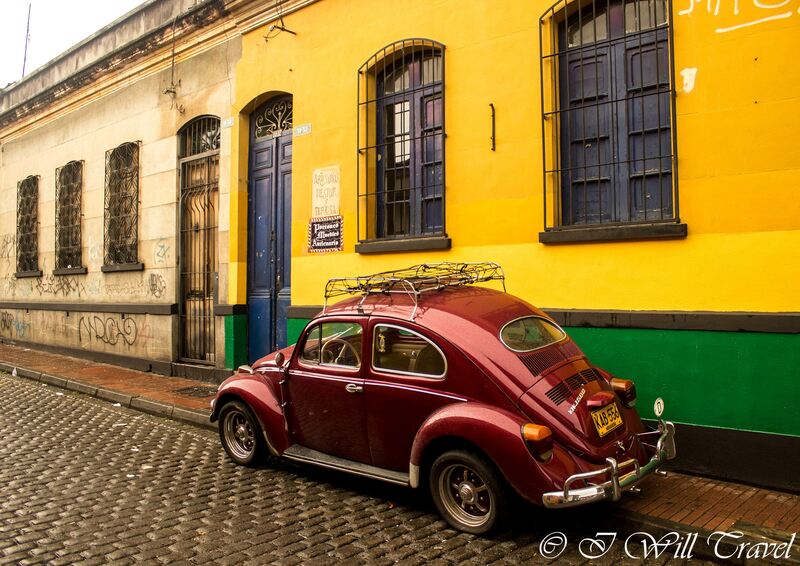 I know you would love La Candelaria neighbourhood, it’s very rad. These are the streets that I walked in my puberty. La Iglesia de la candelaria, at la cuarta con once corner. The library Luis Angel Arango close by. Inclusive in one of those picture is the house I lived in it. For an instant I was transfer to that place that I keep deep in my heart. Thank you. William, it’s a pleasure to be able to do that with my camera. It’s why I do this. Thank you for sharing something so personal to you with me. Wow it looks like an amazing city, even when it’s raining! I love how you describe that her past is very much present, it makes it sound like it’s so easy to capture the history of Bogota, and it looks like it from your pictures! Thank you Aggy. The city has a lot of history and it’s very photogenic. I could walk around its streets for hours. She’s very enchanting. Do you have any plans on visiting? Thank you! But I can’t take all the credit. Bogota is very photogenic. I agree with the others… Gorgeous shots. While I realize much of that is inherent in the location, you do have an eye for composition and lighting. Thank you Maria. I’m glad that you liked the shots. Very interesting town, I see old and classic cars, but I also see a modern bus. I hope I can get there somehow this spring, I truly want to see and feel the place. Will, you truly know how to capture the essence of a city. Keep up the inspiring writing and amazing photography! I love rainy season & obviously i was trying to Walk On A Rainy Day on the road. when Nepal holiday come then i was try to do this and this moment is really enjoy full, thanks admin for the article. I love rainy season & obviously i was trying to Walk On A Rainy Day on the road. Wow, those photos really tell a story. Thank you very much for your comment. Truly appreciate it! I love rainy day and love to walk on day with drizzling.